BRINGING a spring-scented sensation from the garden to the plates, Pearl Lounge at The Ritz-Carlton, Guangzhou is partnering with French fragrance brand Scent Chant to present the Tangerine Afternoon Tea with an enchanting fruity touch. Guests may savor the luxury afternoon tea, served in elegant Legle France Diana collection teaware, from now until April 30. The talented pastry team from The Ritz-Carlton, Guangzhou drew inspiration from the fruits in season, crafting the savories and sweets with an abundance of tangerine ingredients. All the delicate items are served in a vintage rattan suitcase by Scent Chant with a perfume collection. Guests who enjoy the afternoon tea may get one complimentary perfume letter to Scent Chant stores. 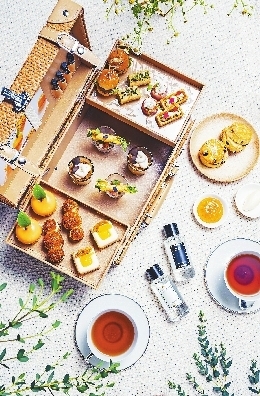 The afternoon tea set is available daily from 2 p.m. to 5:30 p.m. through April 30 and is priced at 311 yuan (US$45) per set and 536 yuan per couple.